The history of the head wrap is vast, political, and cultural. That’s why I dedicated a whole hour to it. My Afro Archives On Air podcast number 3 is dedicated to Head Wraps. 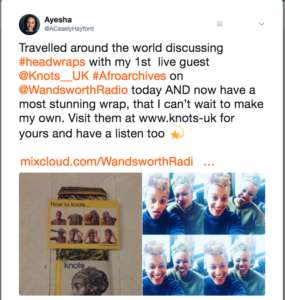 With my first live guest, Sandra Soteriou of Knots UK, we travelled the world from Japan, to Nigeria, discussing head wraps. We also gathered information on head wraps worn in cultures and religions from Sikhism to Islam. We looked at the Hermes headscarves designed in times of war, and elaborately styled head wraps worn by women of colour in protest to the Tignon Laws. Basically, we did a whole lot of unwrapping of head wrapping. 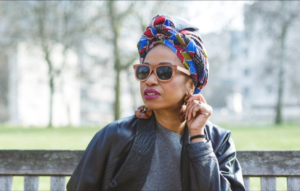 Knots UK is an online company providing head wraps to all. 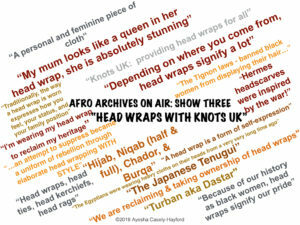 Owner Sandra Soteriou is a friend of mine and together in this Afro Archives Podcast, we share interesting head wrap facts and also Sandra’s own philosophy on head wrapping. 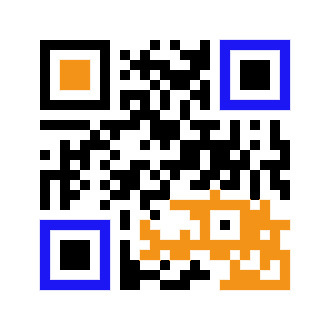 Consequently, we offer to all some great and interesting facts and information. “Whenever I wear my Head Wrap, I feel like…I’ve arrived. I command the room. I’m wearing this Head Wrap because I want to stand out, I want to be noticed. I don’t want to be invisible – that’s not who I am, and that’s not what we should be. We should command the room and that’s what I believe. In our podcast, you can hear all about how and why Sandra began her business Knots UK including her passion to help women who have lost their hair through chemotherapy or alopecia and in other ways too. Sandra’s aim is to install confidence when wearing a head wrap. As well as building confidence, head wraps are worn for ease of managing hair and also religious reasons. We therefore tackle all of that sharing facts on the Hijab, Niqab, and Burqa. The Turban (aka the Dastar), and the traditional Tenugui from Japan. We look at historical uses of head wraps during times of war to give signals and messages, as well as efforts by overlords to oppress. I cannot express how much I loved doing research for this show. Through researching, I have learnt how much more there still is to learn on head wraps and therefore that one hour was nowhere near enough! The whole of Afro Archives On Air show 3 is filled with Sandra’s playlist and it was one of the most fun playlists we’ve had. I enjoyed Sandra’s company so much and you can enjoy all the songs Sandra picked here. Have a listen or if you prefer, have a read of Head Wraps on Afro Archives On Air. There is so much to share and as a result, this show is certainly just scratching the surface. I have therefore added links for further and background reading in the transcript, so, there is plenty to follow-up on. Be part of it all, and most importantly create & share your own head wrap stories with us.